This accommodation guests can book as all house sleep 6 persons, or each room separately. House with garden is situated at the most attractive part of Dubrovnik (Ploce) with a panoramic view of the Old Town Dubrovnik, Island Lokrum and Adriatic Sea, which you can reach in 2 minutes walk. It has 101 square meters and consists of a one double with sofa as additional bed and one double bedded room . There is a kitchen, dinning and living room, two bathrooms. Whole house is air conditioned and it is fully equipped and furnished. Each room has Radio and TV. East side terrace have Garden grill which you can use with no extra charge. The Old Town, the center of all happenings, with numerous monuments, galleries, concerts, together with many cozy restaurants and cafes that are all located inside the city walls. Walking distance to the Old Town and the beach is less than 3 minutes. But the return trip is longer because of the climbing upstairs. As an alternative, guests can use taxi which is very cheap and costs ca. 6 EUR for 4 persons. Bus tickets for 4 cost the same. Other options are to use car or scooter. The Master double room with King’s bed sleeps two person overlooking the sea is 22 m²(237) ft² with Air Condition and a private bathroom with toilet and a small hallway so far. The room has a refrigerator, a TV and a radio alarm clock. The guest can use the kitchen, dining room and Garden Grill. From East and West terraces, you have a beautiful view of the sea, the island Lokrum Old Town. The Old Town, the center of all happenings, with numerous monuments, galleries, concerts, together with many cozy restaurants and cafes that are all located inside the city walls you can reach in 3 minutes walk. Guests can use kitchen & dining room and Garden grill without extra charge. For winter season house is equipped with central heating system. The twin bedded room overlooking the sea is 16 m²(172ft²). The room has Air Condition. refrigerator, TV and a radio alarm clock. The guest can use the kitchen, dining room and Garden Grill. This room share bathroom and toilet. From East and West terraces, you have a beautiful view of the sea, the island Lokrum Old Town. At the anchorage you can see the very large yachts of famous personalities. The Old Town, the center of all happenings, with numerous monuments, galleries, concerts, together with many cozy restaurants and cafes that are all located inside the city walls you can reach in 3 minutes walk. The public beach east & west is only 3 minutes walk. The living room with balcony and double bedded sofa for 2 persons and an additional sofa bed and a beauty full view of the sea is 28 m²(301 ft²). The room is equipped with Air Condition a refrigerator, SatTV and a radio . The guest can use the kitchen, dining room and Garden Grill. This room share bathroom and toilet. From East and West terraces, you have a beautiful view of the sea, the island Lokrum Old Town. The Old Town, the center of all happenings, with numerous monuments, galleries, concerts, together with many cozy restaurants and cafes that are all located inside the city walls you can reach in 3 minutes walk. There is also , as well as a terrace , which can be used by guests only and which is equiped with table , chairs and garden grill. Our guests can freely use our outside grill to cook their own food. A beautiful pebble beach is only 300 metres away. Many beautiful walking areas can be found near House with garden. Take a stroll along the sea with many pebble and rocky beaches nearby. shops, post office, bank, restaurants and cafe bars are also close by. Thank you for the more than pleasent stay in your beautiful home . I felt like I was at home here . The town is lovely as are you . I hope to see you again somday and would like to stay in touch through e-mail. This modern apartment is suitable for 4+2 persons . It contains two bedrooms, each one with air conditioning units (cooling and heating), SAT/TV bed-clothes, bedspreads, towels and telephone for local dials (Dubrovnik region). One room has a matrimonial bed, while the other room has twin beds which can be put together if required by the guests. Studio Apartment with sea view - House with garden Studio Apartment with King’s bed sleeps two person overlooking the sea is 22 m²(237) ft² with Air Condition and a private bathroom with toilet and a small kitchen in hallway so far. The Studio Apartment has a refrigerator, a TV and a radio alarm clock. From East and West terraces, you have a beautiful view of the sea, the island Lokrum and Old Town. The Old Town, the center of all happenings, with numerous monuments, galleries, concerts, together with many cozy restaurants and cafes that are all located inside the city walls you can reach in 3 minutes walk. Guests can use Garden grill without extra charge. For winter season house is equipped with central heating system. House with garden are located in a peaceful and quiet area and surrounded with Mediterranean sub-tropical vegetation, our accommodation will enable you to fully enjoy your vacation. 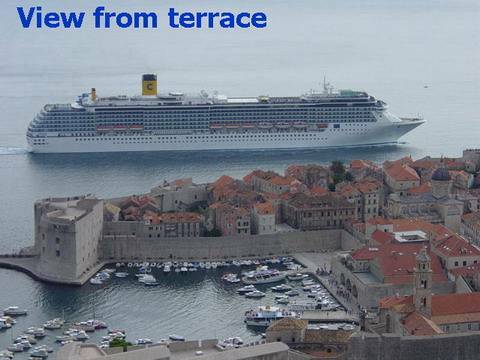 We will be happy to arrange pickup from Dubrovnik airport for you. A driver will await you in arrivals with a sign bearing your name and drive you to your selected destination . Payment will be made directly to the driver in cash (either Euros or Kuna) upon arrival. From Central Bus Station you should take local Bus No. 8 and get off at Bus station called(Zicara). 20 met. from Bus Station , East direction , you will see street Obodska . IF you travel with GPS our coordinates are 42º N ; 18º E .